Railay Beach & Krabi, where in the world? Railay Beach also known as Railey beach or even Rai Leh beach, is located in the South of Thailand. 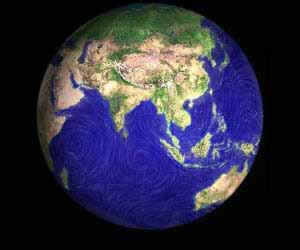 Use the zoom buttons to get a better idea of where we are in relation to the rest of the world. You can fly around Railay with our new interactive maps, or try our Google Earth file. The first step is getting to Thailand. There are direct flights to Bangkok from most major airports in the world. From Bangkok you have to get to Krabi. You can catch a bus, train, or plane. Planes connect from Bangkok to Phuket every hour. Flying time is about one hour. It is even possible to fly direct to Phuket. From Phuket airport it is a two hour taxi ride to Krabi or Ao Nang. Krabi airport opened in 2000 and is flying to an ever increasing number of destinations. They is now even an international terminal. 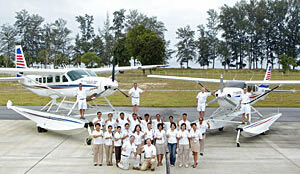 There is an ever changing number of combinations which fly internally and internationally to Krabi. Rather than give you lots of quickly outdated time tables, we've provided links to each airline's time table. We can provide you with transfers on request, but you will find it cheaper, and very easy to arrange this yourself on arrival at the airport. From the airport a taxi costs about 500 Baht to Ao Nang. From Ao Nang it's a 15 minute boat ride at about 60 Baht per person (more if it's dark) to Railey Beach. Thai Airways fly 5 times daily Bangkok - Krabi - Bangkok. Morning and afternoon flight. It is now very easy to book online. Make your booking and print out the invoice, which then becomes your ticket. Now that is dam handy! They also tend to get very full. Asia Air fly 1 time a day Bangkok - Krabi - Bangkok. Starting March 2006 these guys offer the only competition to Thai airways. They have cheap online tickets starting at 399 Baht. fly12go.com these guys are the latest fliers to Krabi. They also look the cheapest. Haven't tried them yet, but shall do soon. Bangkok Airways fly twice daily Samui - Bangkok - Samui. They also fly Bangkok - Phuket. They may restart their Bangkok - Krabi service, so check their site. They do online booking. Silk Air fly Singapore - Phuket or Singapore - Bangkok. They may start to fly to Krabi again so it's worth checking their site. Nok Air - Bangkok - Phuket- Now also flying Krabi to Bangkok twice a week. If you are from Sweden then there is Novair These guys charter whole planes and fly at random times directly from Sweden during the high season. Since I can't speak Swedish I have no idea of the details but they have a web site. Alternatively you can get someone like Special Departure's to take care of the whole thing for you on line. You can catch the shuttle bus to AoNang (150 Baht) or Krabi (90 Baht)- The buses are timed to meet the flights. The train from Bangkok runs overnight to Surat Thani. The sleeper is comfortable and relaxing. You then take a connecting air conditioned bus to Krabi. This takes about 2 hours. All together it takes about the same amount of time as the bus, but you get to lie down and actually sleep. For timetables and online train booking check out the Thai railways site. There are numerous buses going direct to Krabi. Buses range from local death traps to ultra luxury air conditioned super cruiser. It typically takes about 15 hours. It's really cheap, but a little masochistic. 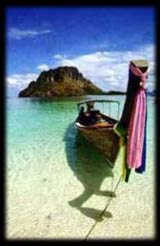 During low season when the weather is rough, you need to get a boat from Ao Na Mao or Krabi. These days most boats go from Ao Na Mao and it's only 15 minutes from there to Railey Beach. Boats from Ao Na Mao now run untill midnight all year around. From Krabi it takes about 45 minutes. Boats are caught from the pier in Krabi, but they are infrequent.